Subaru Outback - Subaru Outback Forums > Vendors > Discount Tire > Looking for an economical winter wheel? Check out the new MB Wynter! The MB Wheels Wynter is a split 5 spoke wheel designed to withstand the harsh winter conditions! Click here for MB Wheels Wynter Availability and Pricing online through Discount Tire Direct for your Outback! This wheel features machined cut-outs in each spoke for added style and dimension. 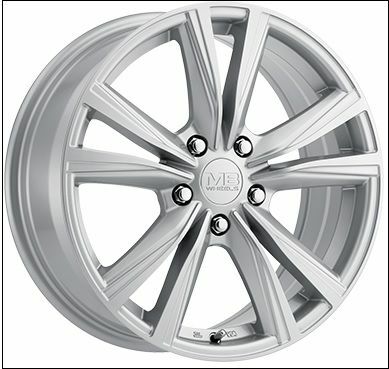 The MB Wheels Wynter comes with a snap-in center cap featuring the MB Wheels logo and built-in popular 15, 16, 17 and 18-inch sizes in a Silver finish. Lifetime warranty on the structure of the wheel to be free from defects in workmanship and materials. Winter tires deliver safety and control in cold temperatures. Made from a soft rubber compound, these tires are designed to stay flexible to provide extra traction and stability in snow, slush, or ice. Winter tires are available for a wide variety of vehicles, so you can ride safely in winter no matter what you drive. Save money on installation and let Discount Tire Direct mount and road force balance your winter wheel and tire package for FREE!